Home Blog What Are Mother Nature’s Bed Bug Treatments? But the Earth itself has been killing Cimex lectularius for as long as humans have been around. And while we’d like to give it a shout out for doing so, we’d really appreciate it if it would just finish the job! Since Mother Nature won’t wipe them out completely, we figured we’d try to learn her secrets and take a few hints. Here at The Bed Bug Store, we’re big fans of finding ways to kill bed bugs naturally. And while we won’t be sending you any assassin bugs to deal with your bed bug infestation, we will be sending you all-natural remedies for bed bugs. Here are some ways that the world around you is already taking care of bed bugs, some of which we’ve developed into our natural bed bug killers. There are many essential oils out there — such as cinnamon oil, clove oil, peppermint oil, lemongrass oil, lavender oil, eucalyptus oil, thyme oil, and tea tree oil — that all claim to work as a natural bed bug repellent. But you don’t just want to repel the bedbugs; doing so just sends them to other parts of the house. You want something that’s going to kill the bed bugs, not just make them smell good and run! You’ve probably heard that bed bugs can survive for a year or more without food. How can that be, because all living things need water to survive? Well, they can absorb the moisture they need from the water vapor in the air. We have put together a proprietary blend of oils and other all-natural ingredients that are safe for pets, plants, and, of course, human. It’s not safe for bed bugs, though, because it covers their bodies and prevents them from getting that moisture they need. Some of our essential oils contain other ingredients that we’d rather not disclose, because they’re the secret to our success. Let’s just say that other bed bug control companies wouldn’t mind finding out what they are. When you order from The Bed Bug Store, we’re not going to be sending you any leaves. There are certain types of leaves, however, that can be used to fight bedbugs. Some cultures in the developing world spread bean leaves around their beds at night. While that might at first sound superstitious, it’s actually incredibly effective. The bean leaves contain tiny hair-like particles called trichomes which stand up from the leaves. While they might not seem very painful to us, they are just the right size to pierce the bed bug legs at the joints, causing them to become caught. All you have to do then is dispose of the leaves and bugs in the fire. While the bed bug traps we offer today are already very effective, you might see some that are trichome-based in the future. If a living thing exists (or a dead thing that was once living), something will eat it. Luckily there are insects and spiders out there that tend to have a deliberate interest in keeping bed bugs at bay. Let’s take a look at some of our favorites. The Masked Hunter - Just because you have these guys around doesn’t mean that you have bed bugs, but if you have bed bugs you’ll want these guys around! 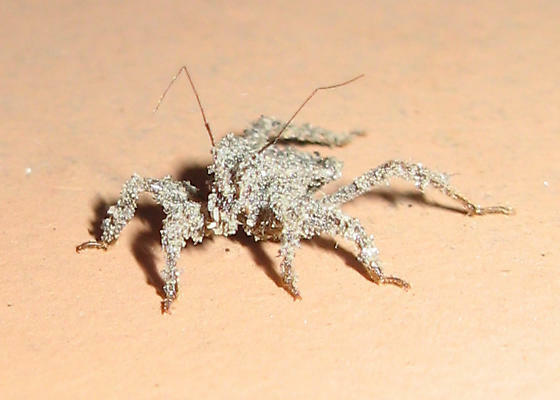 The masked hunter is in the assassin bug family and dines on bed bugs and other insects. The nymph of this insect has some of the coolest camouflage around; it secretes a sticky substance from its skin and picks up dust that it comes in contact with. It even covers its antennae and and doesn’t seem to mind getting dust in its eyes. All it takes is one walk across the dusty garage floor and this thing is ready to hunt! Spiders - We know, we know...finding a spider in the house can be disturbing. And some people just hate the idea that they have to share a space with our eight-legged neighbors. But in almost every case, a spider is doing more good than harm. Not only can they help keep bed bug populations down, but they also hunt home intruders that are even more disgusting (we’re looking at you, silverfish). One spider has made bed bugs a regular meal is the spider Thanatus flavidus, which is native to Russia, Ukraine, and Greece. Don’t worry, we won’t be sending you any as a natural bed bug remedy, no matter how well they might work. Cockroaches - Here’s something that won’t surprise you: cockroaches eat anything. Like humans, they’re omnivores, but they’re much more likely to be dining on rotting food, including meat and plant matter. In general, cockroaches are scavengers, but there are species that have no problem chowing down on bed bugs. Ants - Don’t mess with ants, because ants will mess you up! One estimate puts the number of ants at around 10,000 trillion, and if they could all get together they’d have no trouble taking over the planet. Compared pound for pound, there’s more biomass in ants than in humans. Luckily, they’re more focused on eating everything else, including bed bugs, than in taking over the world. One worldwide species of ant, the pharaoh ant, is particularly keen on taking out bed bugs. You don’t want them in your house, though, because they’ll never leave. Best to go with our all-natural insecticide for bed bugs that you can control. Along with our bed bug spray, our crawling bed bug dust is another popular way to handle bed bugs around here. Made from the ground up shells of ancient sea creatures called diatoms, the dust gets on the body of a bed bug and removes a waxy coating from its exoskeleton, causing it to dehydrate and die. Also, because diatomaceous earth is inorganic, it’s going to stay around in your carpet for a while until you vacuum it up. We don’t advise you spreading bean leaves or inviting invasive spider and insect species into your home, but we can most certainly recommend a good bed bug spray or crawling insect control dust. Get rid of your bed bugs fast with The Bed Bug Store!